I was driving around just below Lincoln Heights in the LA River industrial area taking sunset and nocturnal photos. I was done for the night when I drove past this creepy bus. I kept going for a few blocks and then cursing to myself because the image wouldn't let me go home yet, I went back an shot a quick photo of it. I ending up cropping it to close to the left and did the same in the painting. I framed it in a dark frame, it think that helps it breathe. I went very thin with the oil paint on wood 16x24. That literally took my breath away when I saw it. hanks Leslie, the bus it's self did the same to me. Do you know the George Billis gallery? I think you would like some of his artist's. You are right-lots of good work in George Billis' galleries! Thanks for the link. Back to "Dark Bus" -one of the (many) great things about it is the implied story because the setting is so dramatic. I have visions of psych. prison inmates using it as a getaway vehicle...Dark Bus, please don't stop in my neighborhood! I think this is a really nice painting. It's kind of creepy. I love that despite the bleakness surrounding it, there's still some life (or maybe the memory of motion) in it that makes me think you could just get in and start it right up. Don't, though. damn nice. i love it. I dunno. i think your paintings are beautiful and could be considered feminine AND masculine. I love the washy look of this Bill, it was a very effective approach to the light between the buildings. You sure got the creepy mood thing going too. I think the rag strokes contribute the the movement feeling BG. But yeah don't start it. Marlo, I do have a soft side. I like pretty flowers, salads and riding horses naked. WOW - that is great, Bill. wow, this is one is _really_ nice! super-cool! If I was smart I'd to twenty in the same style. Nice work. I love finding oil painting in the blogs, and these are very well done. You could get über creepy and do some Chinese Death Vans as part of your series....nice job! thanks Dave your work is a real find... Well done. What are Chinese Death vans? thanbks Alberto , I love your work too. You must really enjoy painting to risk the Chinese Death Vans. Seriously, I want to know too! I'm thinking I must live a very sheltered life. Whoa- Nice one- this has a very new and different feeling from the rest of your paintings, whatever it was- Ill be looking out for more of it. Good luck with the show. I really like your work, especially the moody ones like this bus and the sunset silhouettes. You've got a great sense of light and colour. Fantastic painting, I really like the palette you used on this, and the story that went with it. Thanks for the inspiration! 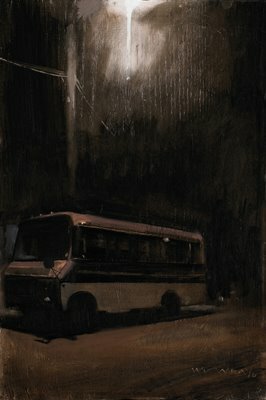 How you can paint a dramatic, eerie bus is beyond me... That could easily be a Stephen King book cover. That bus looks like a big drop of molten metal is about to fall on it! I really enjoy paintings of yours where a limited palette is used (like this one). Bill, do you ever wander down into the LA River's actual riverbed, where it's paved with concrete? Moody and dark, but there is something very spiritual about the light. Thanks for stopping by. It's gratifying when artists comment positively, but when Abstract artists do, I really think I'm getting somewhere. Your welcome Ryan, use me anytime. ;-) I like your digital cartoon style keep it up! Drive about in industrial neighborhoods at night and you will find plenty of scary subjects. Glam I'm down there often. I have a La river painting from down there in an early bolg. This is an absolutely amazing painting. Hey Miles sorry I've been a bit flaky. Getting ready for the show and another big project to finish up before I go. I've been following your blog and I think this is my favorite Bill Wray painting ever. The mood and composition is just ... better left unsaid. I hope I can follow it up soon. I don't think I've seen anything like this before. Powerful and mysterious painting. I especially like the light at the top. You are extremely talented and I look forward to seeing many more of your works. thanks Liz you have to be in a certain mood to do these one's. can't fake it. "Dark Bus" is definitely a favorite. Great work. I love this one. I don't think this is necessarily creepy at all... it just reminds me of being on a road trip late at night and pulling into some random town where everything is closed... and then maybe lurking around in residential areas peeking through windows and taking clothes off of people's clotheslines and smelling them. Nothing creepy about that.